As a black cinephile, retired emo kid and budding connoisseur of artful horror, I knew that seeing “Us” was going to be everything. Periodt. I count “Get Out” as one of the best films I’ve seen in awhile and one of my favorites. I love the trickle of suspense Jordan Peele takes pains to create. And I love that the terror is based in the everyday global horror of being black in white supremacist, neocolonial spaces. I also credit Peele’s masterpiece with getting me back in touch with my gore wh*re roots. 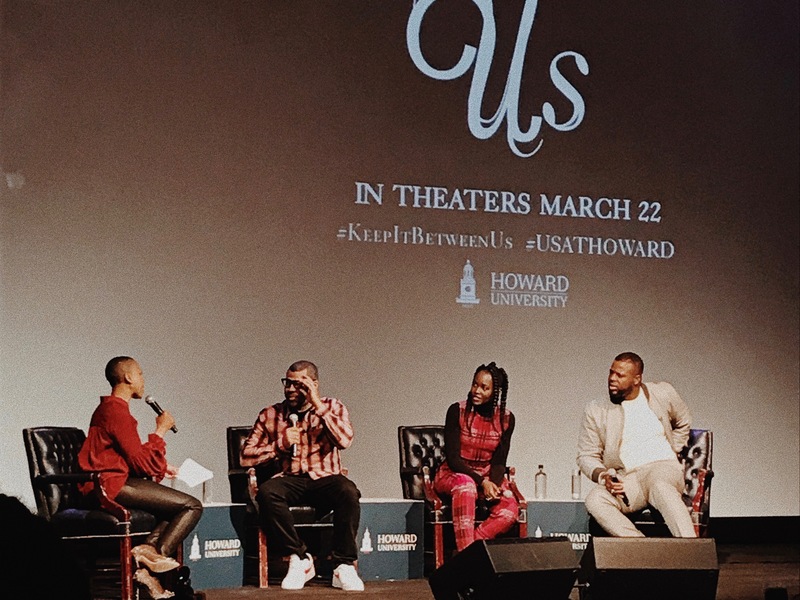 That being said, when I heard-tell on Twitter of a Howard University screening of “Us” — Winston Duke’s beautiful, broad chest emblazoned with the university’s logo wasn’t for naught — I knew that it was somewhere I needed to be. You see, because the best cinematic experience I’ve ever had was the advance screening of “Get Out” I attended at my alma mater, Syracuse University. Second to that was when a bunch of black student orgs got together to rent out space at the theatre in Syracuse, NY’s Destiny Mall. Some people hate when other moviegoers during film screenings and that’s their prerogative. Me, I’m smitten with film culture. I don’t just care about the work: I care about how the work affects people. So to be sat amongst friends and strangers, largely people of color, and to soak in the ways in which racially significant films are affecting them, affirming them, validating them, empowering them? It’s a dream to me. Seeing “Us” at Howard, I knew, would be that dream realized. Oh, and gazing Lupita Nyong’o in the flesh was just a bit of sparkly glaze on the sponge cake. It seems like the entire HU populace was about as moved. The sanitized version of what happened around 10 a.m. on March 18, 2019, is that there was great turn-out for the tickets. A more apt description is that it was a blood-bath: my girlfriend got elbowed in the face and earned a bloody nose for her ticket-oriented efforts. She’s 5’8″ and a top, and was bodily moved by the vicious crowd. I am utterly disgusted. @HowardU there needs to be a better system in place for distributing tickets because today was pure chaos. We should have a model similar to the Youtube Black Fanfest from last year b/c people got hurt today & this wasn’t the first time. Let’s do better. War wounds and all, the bag had been secured. I was going to see “Us” at Howard. Monday was fine. Tuesday was the worst. I grappled with how early I should go to bed and how I’d force myself to stay asleep. I made a game plan for working from the Shaw neighborhood so that a 4 p.m. clock out wouldn’t jeopardize my spot in Cramton Auditorium. I did make it there a bit before the event’s official start time of 5 p.m. Nothing happened until like for an hour and a half, by the way. Whether it was Howard running on CPT or Howard anticipating moviegoers would run on CPT, the hour-long wait provided some little comforts, if not an anxious air of anticipation. It gave folks time to scoop some free popcorn, candy, and drinks. It also ensured you’d get the perfect Instagram picture for the little “Us” red carpet that had been set up. Pre-show bops — think “Knuck if You Buck,” “Thotiana,” and that now-iconic, chilling rendition of “5 on It” — stirred the energy of the crowd. That hour gave people a chance to settle in and happily receive the admonish not to record the film, the promise that good behavior would rewarded with a sparkling Q+A, and the promise that we’d be impressed and thrilled with the impending horror ride. This mild look of glossy distress is me asking a stranger to flick me up and knowing this picture probably won’t be what I need it to be. And I was wholly impressed, although, I was clutching my wig the entire time I was on it. All my friends who’ve succinctly picked my brain have earned this: the storytelling method Peele employs in “Us” is the same he employs in “Get Out.” But, as he pointed out in the Q+A, that other movie was a horror flick about race. This is just a horror story that happens to have black people in it. No, at the forefront. Plus, Nyong’o is the lead, putting a woman — no, two women — at the forefront. (She kills it and it’s clear that Nyong’o was taken, as she indicated in the Q+A, with the script because Peele offered her “two well-rounded, three-dimensional women” to play. But more on that later.) And while the film is apolitical in a sense, it’s very political by virtue of who gets to be in it and “be” apolitical. I think what has prevented me from getting lost in the idea of having a tethered self lurking in the shadows, searching for the opportunity to untether me from this Earth, is the warmth and pride I felt watching this black-*ss film unfold so excellently. Something I enjoyed about “Us,” too, is that the action unfolded quickly. But it wasn’t one-track-minded. You think that this was one kind of story, but “Us” twists into another, and then another. The imagery of red and scissors and cut-outs and tethering and untethering running throughout? Lord. And the climax that blends it so beautifully? Lord. From start to finish, the film does a bang-up job asking questions about self vs. the Other, us vs. them. And without giving too much away, you might find that actually, the scariest bit of “Us” is how it messes with concepts of self. Other lovely tidbits is that the soundtrack is fab. (I thought “Us” has ruined Luniz’s song for us all, bless them. “It’s all about taking feel-good anthems and ruining them,” Peele joked during the Q+A. But there’s actually a 2019 remix called “5 on Us” with Luniz, Krayzie Bone and Damon Elliott, and it’s actually kind of endearing.) And oh, and back to Nyong’o nailing it. The main question I wanted to ask Duke and Nyong’o was: “What was your process for defining each of your characters, as far as physicality and mannerisms go? What kinds of things did you keep in mind?” I didn’t get to ask it, but Nyong’o inadvertently answered the question. She revealed that she took ballet classes and researched spasmodic dysphonia to come up with Red’s voice, riffing off a line in the script said Red spoke like she hadn’t used her voice in awhile. And now, the two hot takes you’ve been waiting for. 1) I don’t know if “Us” is better than “Get Out.” It’s wonderful and clever in a completely different way. But “Us” feels satisfyingly well-done right now (it’s hitting, but that may be because I’m sat at my kitchen table wearing my “Us” shirt and my last two brain cells are dancing to cello version of “5 on It.”). So that’s what I’m going to stan all 2019. 2) Yes, Nyong’o and Duke are just as hot radiant and delightful in person as they are on Twitter and Tumblr and in the magazines. Please marry me Drop the skin care routine, sis. The way Nyong’o’s luminescent skin stays glinting, even in moments of dire distress, might almost be enough to distract you from the weight of “Us” and the imminent dangers within that it seeks to explore.